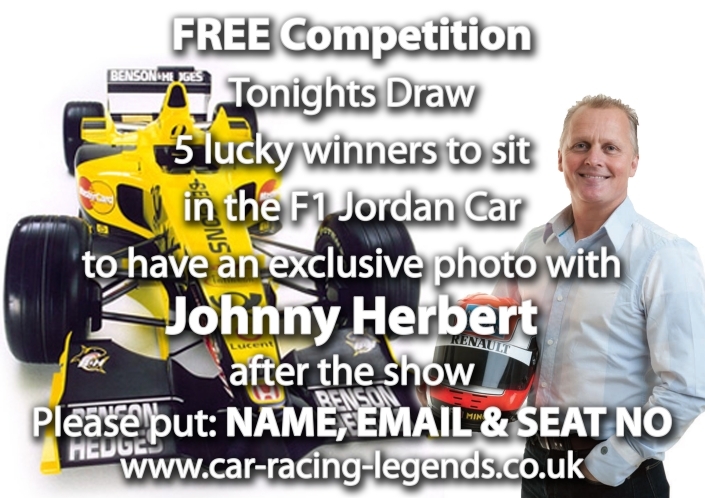 Car Racing Legends and Johnny Herbert would like to thank everyone who Registered and Tweeted to make up the 1000 followers iPad competition, which 3 lucky winners! will be drawn today at 6pm GMT time and announced on our home page. Good luck! Thanks to all who entered our free competition in the foyer on the night. 5 lucky winners where picked by Johhny to have their picture taken in the amazing Jordan car we’re taking with us on tour. Take a look at the pics below and if you are one of the winners and would like a picture as a souvenir of a brilliant night simply right click the image and hit save. Thanks again to all who came down and made it a fantastic start to the tour!